It's the time of year when winter's few appeals have long worn thin. All the major celebrations of the season are over (hubby's birthday was on Sunday - more on that soon), and spring seems a long way off. It even snowed here yesterday. I am obviously suffering from February funk. In an attempt to shake off the blahs I've been trying to spend some time outside. Today I went out to see what was happening in our garden. I was surprised to see what was up. 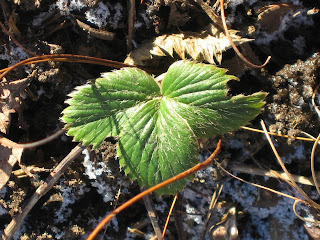 A blackberry vine. This one is a volunteer. I'm not sure if we'll keep it. 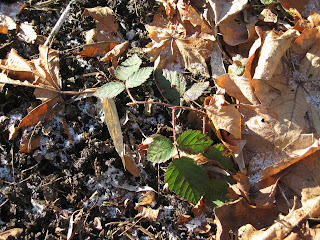 Blackberry vines grow like mad here. Once they start there is a danger that they will completely take over the yard. Sage. 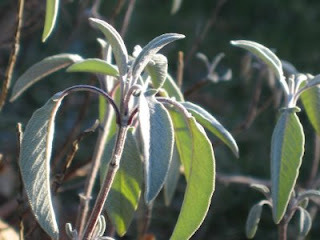 This one grows in a very sheltered spot, so we have sage all year. Oregano, or possibly marjoram is starting to reappear. The first sprigs of mint. 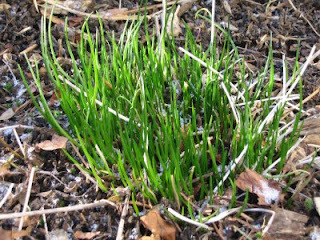 Chives are making a comeback. Snowdrops and crocuses are also starting to bloom, and the first green blades of tulips, daffodils and bluebells are poking through the earth. Our garden consists mostly of perennials. We'd like to have a vegetable garden, but past experiments have been less than successful. Poor soil and urban wildlife make growing veggies a challenge. (We have deer, rabbits, raccoons, rats and a huge assortment of birds.) We do keep trying though. I can't quite decide what to experiment with this year. Maybe greens if I can think of a way to keep the wildlife out. Or more herbs. They seem particularly promising after what I saw out in the garden today. Oh, I love your herb garden! You've got two of my favorites, sage and mint. The sage photo is especially beautiful. I buy fresh sage at the market all the time, but I don't think I've ever seen a sage plant before today. Thanks for sharing! You just made my afternoon. That sage plant came with the house. I don't know how old it is, but we've been here for almost 8 years. It looks a bit ragged at times, but it keeps going. 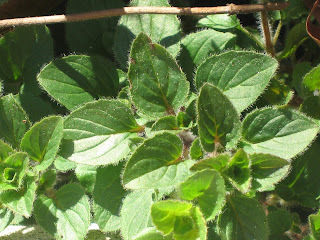 The mint grows in a container. I'm pretty sure we had it on the balcony when we lived in an apartment, so it's more than 8 years old too. I love perennials! Welcome Dreamer! 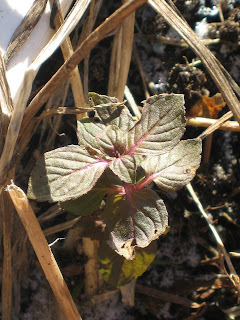 If my garden pics made you hungry, you should check out my April 10 post. There's a garden that will make you drool.